Stylish, new Tween Accent Chair features mixed hardwood frame construction, generous padding with polyurethane foam padding for comfort. It includes a 16" square pillow that is filled with densified fibers and is sewn closed. It also includes an ottoman with two round plastic upholders recessed into the top for added appeal. It includes a 16" square pillow that is filled with densified fibers and is sewn closed. It also includes an ottoman with two round plastic upholders recessed into the top for added appeal. 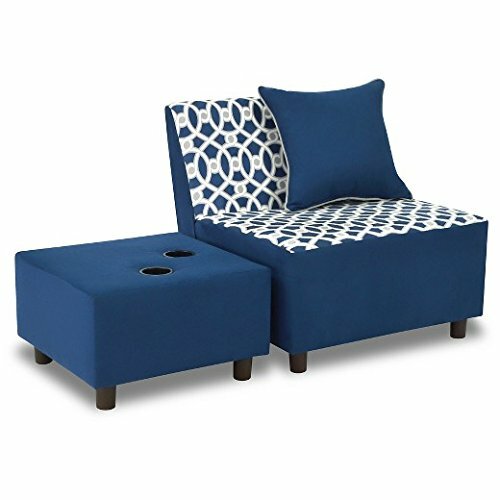 The ottoman is 19.5"W x 19.5"D x 12"H and has a mixed hardwood frame that is generously padded with polyurethane foam for comfort and appeal. The chair is upholstered on the inner backrest and seat surface with 100% polyester microfiber fabric in the new Loopy Navy pattern with its geometric pattern in navy, white and Pebbles grey. The remainder of the chair is covered with the coordinating solid navy microfiber. Bottom is covered with poly/cotton black upholstery fabric. Round plastic feet attach to the bottom corners through pre-drilled holes by twisting tight. The pillow is covered with the solid navy and features a Pebbles grey welt cord trim surrounding the edges for added appeal. The ottoman is covered with navy and has two round plastic upholders recessed into the top surface. Bottom is covered with black poly/cotton upholstery fabric. Round plastic feet attach to the bottom corners through pre-drilled holes by twisting tight. No tools needed. This chair and ottoman may also be used with the #3250-03-LPNVPEBNV Chaise and Pillow Set to form a corner sectional set.